For Fries: Add Cheese & Bake in Oven: $1. Add Bacon & Cheese: $2. Med, Large & X Large cut into 8 slices unless otherwise requested. 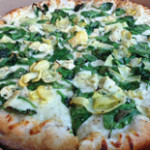 Thin Crust, White Pizza Sauce, Mozzarella, Fresh Spinach & Marinated Artichokes Seasoned w/ spices n’ Romano with a little extra cheese on top. Classic Veggie Pizza – Red or White Pizza Sauce, Mozzarella, Fresh Green Peppers, Fresh Mushrooms, Diced Yellow Onions, Black Olives, topped w/ Romano & a little extra cheese on top. (Or you can swap out any of the veggies of your liking to create YOUR own style veggie pizza) Lasagna Pizza – Red or White Pizza Sauce mixed with seasoned Ricotta Cheese, Seasoned Beef Crumbles, Italian Sausage Crumbles, Mozzarella & hooked up w/ spices n’ Romano. *NEW* Chicken Parm Pizza – Marinara Sauce, Crispy Boneless Chicken pieces, Mozzarella Cheese, Provolone Cheese, and topped with Romano. 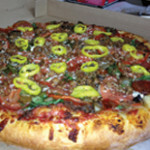 Corner Deluxe Pizza – Red or White Pizza Sauce, Mozzarella, Fresh Green Peppers, Fresh Mushrooms, Pepperoni, Italian Sausage Crumbles, Diced Yellow Onions, then topped w/ Romano & extra Cheese. Meat Lovers Pizza – Red or White Pizza Sauce, Mozzarella, Chopped Virginia Ham, Italian Sausage Crumbles, Pepperoni, Thick Cut Bacon Pieces, Seasoned Beef Crumbles & topped w/ Romano Cheese. A Best Seller For Good Reason! The Godfather Pizza – Red or White Pizza Sauce, Mozzarella, Salami Pieces, Pepperoni, Capicola Pieces, Provolone, Chopped Virginia Ham, then hooked up w/ spices & Romano Cheese. So Italian! Steak N’ Ring Pizza– Thin Crust, White Pizza Sauce, Battered Onion Rings, Seasoned Grilled Steak, Grilled Mushrooms, Mozzarella, Sliced Tomatoes, spices n’ Asiago Cheese! The Farm Pizza– Thin Crust, White Pizza Sauce, Mozzarella, Fresh Baby Spinach, Sliced Tomatoes, Grilled Chicken Or Seasoned Grilled Steak, Sliced Red Onions, Pickled Banana Peppers, Black Olives, Asiago Cheese n’ Spices Tomato N’ Spinach Grilled Chicken Pizza– Thin Crust, White Pizza Sauce, Mozzarella, Fresh Baby Spinach, Sliced Tomatoes, Grilled Chicken, Marinated Artichokes, Seasoned Ricotta, Spices n’ Asiago Cheese! Corner Plate Pizza– Hot Meat Sauce, Home Fries, Seasoned Beef Crumbles, Mozzarella & White American.Topped w/ Homemade Mac Salad, Diced Yellow Onions, More Hot Meat Sauce, Ketchup & Mustard after the Oven! Veggie Extreme Pizza– Red or White Garlic Sauce, Mozzarella, Fresh Baby Spinach, Sliced Red Onions, Green Peppers, Sliced Tomatoes, Fresh Broccoli, Pickled Banana Peppers, Diced Yellow Onions, Asiago Cheese, Crushed Red Pepper Flakes n’ Spices! The Works Pizza – Red or White Garlic Sauce, Mozzarella, Fresh Green Peppers, Fresh Mushrooms, Pepperoni, Italian Sausage Crumbles, Black Olives, Pickled Banana Peppers, Chopped Virginia Ham, Diced Yellow Onions, Seasoned Beef & Extra Mozzarella to hold it all together… Finished off w/ Romano Cheese to form this Ultimate Beast of a Pizza! your choice always served w/ pizza sauce on the side. Try Any Of Our Specialty Pizzas as Specialty Calzones – Available in Med & Large Priced Same as Pizzas. Diced Yellow Onions. Served with sides of pizza sauce. Tossed in your choice of any of our Wing Sauces or Just Naked. The Majority of Our Sauces are Made Daily by us right here in our kitchen. Upgrade Options: Waffle Fries, Curly Fries, Onion Rings. Adding Bacon, Extra Meats, or Additional Sides are an extra charge. Homemade Tartar Sauce, Crinkle Fries, Ketchup & Bread. Extra 2oz Sides of Dipping Sauce or Dressings $.79 ea. 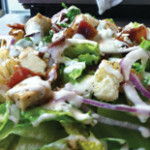 Menu items, pricing, and availability may vary between locations or season. Delivery is charged according to distance from store. Please turn on outside lights for driver. *Delivery charge is to pay hourly staff. It is not a tip and your driver does not receive any part of the delivery charge. Please tip according to your level of service. All prices are subject to change without notice.